Women's NCAA Championship: Connecticut To Face Syracuse : The Two-Way Top-seeded Connecticut rolled over Oregon State 80-51 Sunday to make the women's championship round Tuesday night, and fourth seed Syracuse beat Washington 80-59. UConn's Breanna Stewart (left) celebrates with her teammates after winning last year's national championship. Top-seeded Connecticut rolled over Oregon State 80-51 Sunday to make the women's championship game, and fourth seed Syracuse beat the University of Washington 80-59. Connecticut will be trying to win an unprecedented fourth straight title and another perfect season when the two team play Tuesday night in Indianapolis. 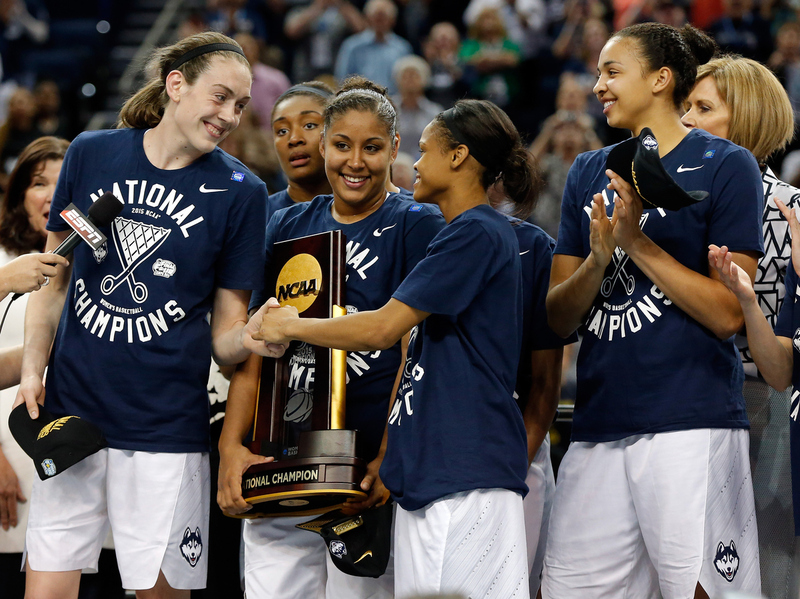 Women's NCAA Final Four: Is UConn's dominance bad for women's basketball? This Sunday's NCAA women's basketball Final Four will mark the ninth consecutive tournament semifinal appearance for top-seeded UConn. But for the three other teams, the Final Four will be entirely new territory. No. 2 seed Oregon State, No. 4 seed Syracuse and No. 7 seed Washington advanced to the Final Four for the first time, to play for a shot at the national championship game. The women's Final Four tips off Sunday at 6:30 p.m. when UConn faces Oregon State on ESPN. The Syracuse-Washington matchup will follow on ESPN2 at 8:30 p.m. Here's what you need to know. No. 1 Seed UConn versus No. 2 seed Oregon State: Is UConn Too Good? UConn has long been a powerhouse in women's basketball. If they win the national title this year, it will be for for the fourth straight time. It would also mark their sixth undefeated season. They are a force to be reckoned with, or according to one sports columnist, a force to be dismissed. Boston Globe columnist Dan Shaughnessy wrote a column in which he argued that the UConn team was too good for their own good; that they were smothering competition in the women's college game. Invoking the large margins by which the Huskies have won some of their games, Shaughnessy wrote, "This is not UConn's fault, but it's also not good for the promotion of women's basketball as part of our national sports landscape. Competition is why we watch sports." UConn Coach Geno Auriemma retorted: "When Tiger [Woods] was winning every major, nobody said he was bad for golf. Actually he did a lot for golf. He made everybody have to be a better golfer. And they did. And now there's a lot more great golfers because of Tiger." But David Ubben of the website Sports on Earth told NPR's All Things Considered this week that he thinks this isn't a great counter-argument. "Tiger Woods isn't recruiting the best golf balls and the best golf clubs to come play for him," Ubben said. "But Geno Auriemma has to recruit, every single year, the best women's players in the country. So when he gets a good player, somebody else doesn't get a good player. And so when you're asking everyone to improve your game, well, you could start by handing off some of those good players to other programs." Christine Brennan, a USA Today columnist argues that this isn't the whole story. "No one says, 'Golden State, we want them to lose,'" Brennan — referring to the top team in the NBA — said according to ESPN. "I think it's the exact opposite. So if we love dynasties in men's sports, why not in women's sports? In women's sports, women's hoops, people are calling out for balance, for competition, for surprises. But we're balancing this against an historic moment, something no college player has ever done." "This is where the conversation hits an interesting intersection," she added. "If it were the UConn men winning four straight with the dominant male player, can you imagine the interest? This would be the lead of every newscast, sportscast, A1 of every newspaper: 'Can the UConn men do this?' We're obviously not seeing anything like that in the case of the UConn women." UConn is the heavy favorite to win, but when the team takes the court on Sunday, Oregon State head coach Scott Rueck is hoping the pressure on the top-seed, led by senior Breanna Stewart, will work to his team's advantage. "Breanna Stewart is going for a record fourth championship in four years," he said on John Canzano's radio program in Oregon. "There's some pressure... I don't know if it will impact her but from our standpoint, I hope so." When the teams met in November, Syracuse won a tight contest 66-62. Both teams have improved since then. ESPN analyst Graham Hays says the biggest improvement is in ball control. "The Huskies averaged just 8.5 turnovers per game in the first four rounds. Granted, they also didn't face pressure like Syracuse, but they will have the upper hand if they can keep the ball," he said. "On a Washington team that has made one of the more surprising runs in recent NCAA history, there may be no bigger surprise than what Osahor has done. She has gone from role player to star during Washington's NCAA run, including a pair of games in the regional that will be hard to top. "Osahor had 19 points, 17 rebounds and five assists in the Sweet 16 win over Kentucky, then followed up with 24 points and 18 rebounds in Washington's win over Stanford to reach the Final Four for the first time in school history. 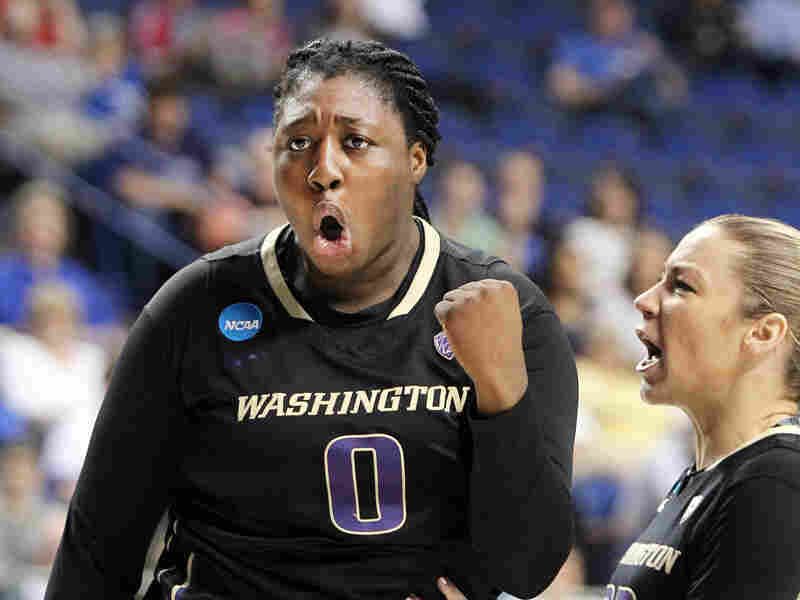 Washington's Chantel Osahor celebrates a basket during the team's win over Stanford on March 27. "No wonder she was the MVP of the regional.
" 'It's a little strange because I've been doing the same thing since I've been here, since I've been playing basketball,' Osahor said. 'Now that it's getting attention, it's pretty cool.' "
She also gets attention for her unusual shot: she shoots — and scores — without her feet ever leaving the ground. This type of set shot is unusual, but she's not concerned. "I think my shot is pretty nice-looking, to be honest," Washington's junior forward said, according to the AP. "Just because I don't jump doesn't mean my form isn't good." For Syracuse, a program that has been rebuilding and improving since head coach Quentin Hillsman took over a decade ago, making the Final Four is a mark of success in and of itself. "I'm happy that it's coming to fruition that we're at the pinnacle of this game," Hillsman said according to the Hartford Courant. "And I think [as] we're moving into this Final Four, you look back at it and you hear how many things that you can't do and it's not possible. And I just think if you continue to stay the course and try to build a program and get the right people and the right players around you, get to the right situation that can happen and I'm just very happy that we're seeing the fruits of our labor here at Syracuse." Hillsman is the first African-American man to coach in the women's Final Four, the newspaper reports. "You have to aspire to be here and to be in the position to win the championship," Hillsman said, according to the Courant. "If it's not your goal, then you probably shouldn't be coaching the team."